Here's the progress on the interior. This is what the interior looked like when I hauled the car home. Pretty dismal, eh? I never liked the diamond-pattern vinyl - I think it looks cheap. You can see the rust holes thru the passenger-side floor. Wires are dangling. Big cracks on the dash. Blech. The driver's side seat was awful, but the passenger side was no picnic, either. The foam on both was split and crumbling and pretty stinky. Old cars have distinctive smells. Put me blindfolded into an old VW and I'll recognize it by the odor. The same is true for an old Datsun. If I'd bought an already-running Z, it'd have a 46-year-old aroma that would bug me, but this one won't. The seats will get stripped down to the frames, and then sandblasted and painted. After that comes new webbing, foam, electric heaters, and really nice reproduction covers. 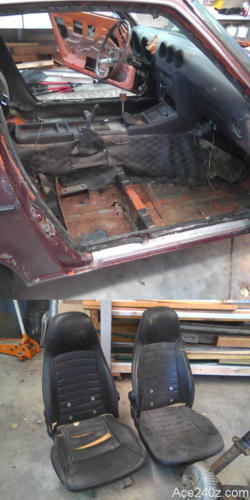 I did the same rebuild on my long-ago '72 and the seats looked and felt brand new. It wasn't easy but well worth the effort. Hopefully the second time will be easier. Here's how it looks today. It's been stripped and sandblasted, and most of the thick rubbery insulation is gone. 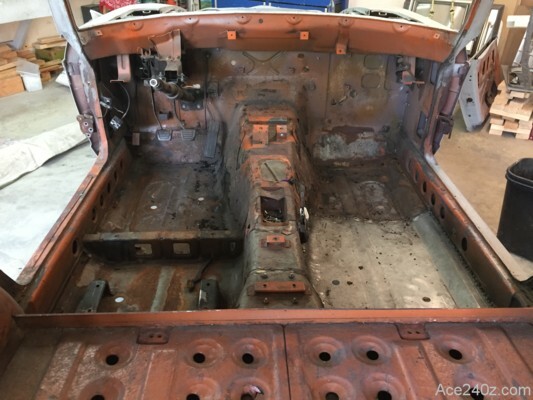 The rusted passenger-side floor has been replaced. There are still a few holes and cracks and gaps that need to be welded shut. Pure excitement. I'm adding a 4-point rollbar, so reinforced mounts have to be fabricated. I'm also adding modern seatbealts (the retractable kind) and they need attachment points. Steel reinforcement channels will run the length of the body, from the front suspension all the way to the rear suspension. When that's done, the car will be far more rigid than when it came from the factory.